COAHOMA - Jaydan Mann is joining the Cisco Lady Wranglers for the 2019 season. 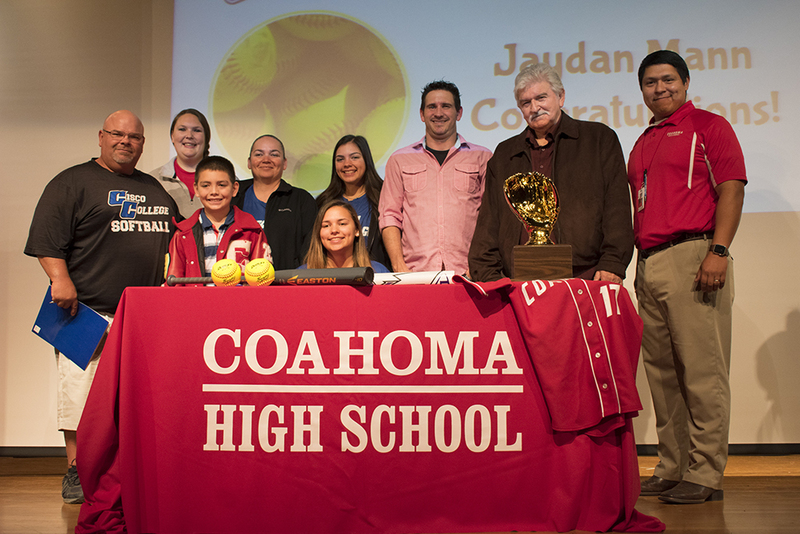 The Coahoma High School senior inked a deal with Cisco College (NJCAA, Division I) this morning in front of her peers during a high school assembly to play softball on the collegiate level. 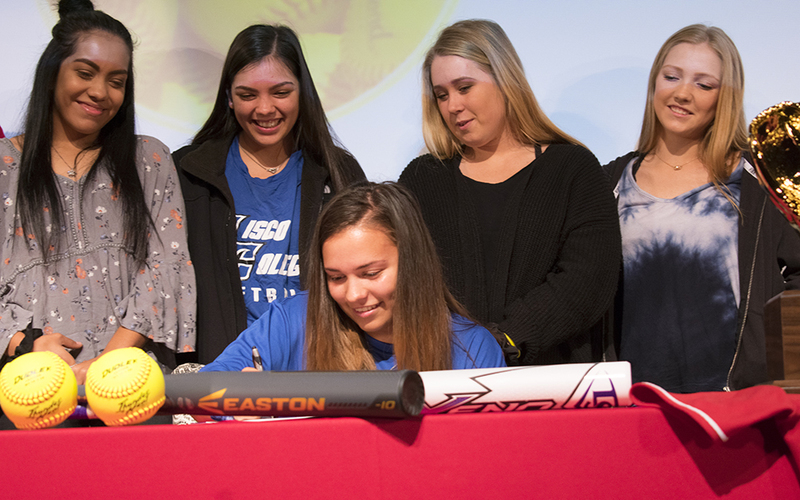 Mann was joined on stage by her family, her CHS softball coaches, Cisco College head softball coach Joel Prickett and by her fellow 2018 Bi-District Champion Bulldogette softball teammates for the official signing. Mann said Prickett, who returned to his hometown to take over the Cisco Lady Wrangler program in October 2017 after 12 years as the softball coach at Odessa College, is one of the main reasons she chose to commit to Cisco. “Coach Pritchett is a great coach and it’s close to home,” she said. Prickett described Mann as a versatile player who will bring a strong offensive prowess to the Lady Wranglers next season. “When you can hit like her, you find your way into the line up,” Prickett said. Orosco added Cisco is gaining a valuable player. As a junior, Mann capped off a stellar season helping to the lead the varsity Bulldogettes to a 19-5 record and a berth in the area round of the Class 3A state playoffs. For the year, she helped led her teammates offensively, hitting .494 and posting a team-high 29 runs batted in. She also hammered out 10 doubles, eight triples, and a home run. Her performance on the diamond last season drew statewide attention. She was named to the Texas Girls Coaches Association 2018 all-star team. “As a player we're going to miss Jaydan being a leader on the field, but most importantly we're going to miss her smile, and her love for the game,” Orosco said.